To select the best video device you need some factors and datas. Lens ratio and the distance will define the image size. The native matrix resolution will affect the quality but the distance between the audience and the screen is also really important. 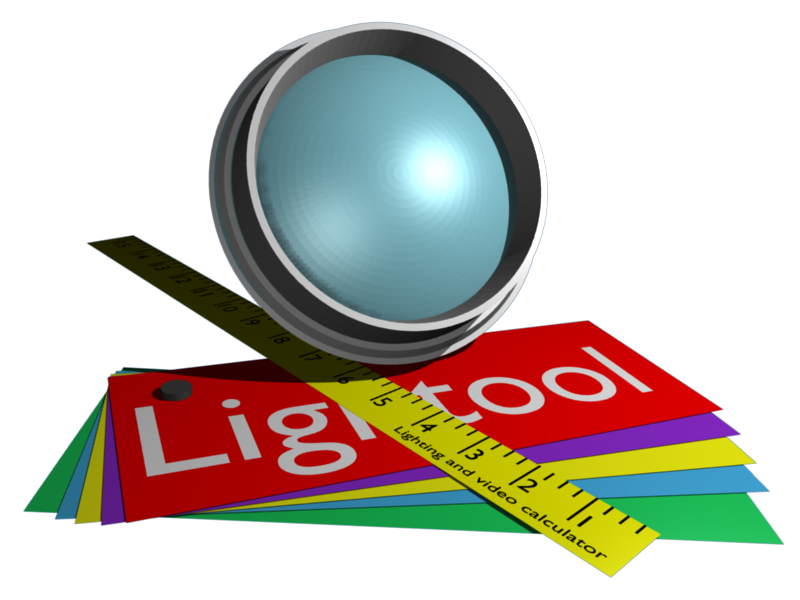 From the "Tool" menu, select "Video". • Projection distance (5) : 1 to 100 meters. • Distance between image and audience (8) : 1 to 100 meters. 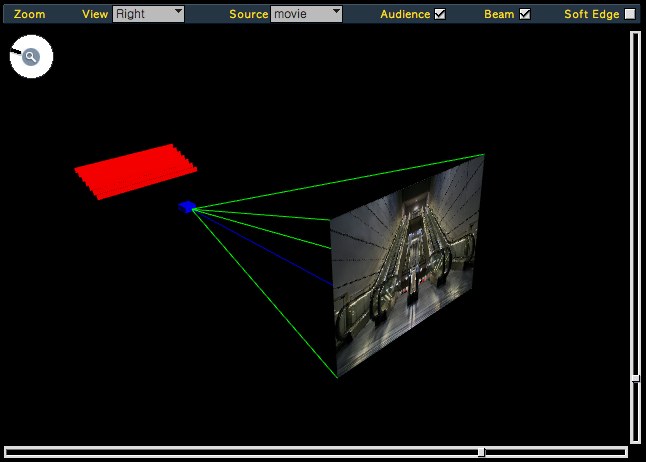 Now you can see the projection size (4) changing according to the distance (5) and the actual lens ratio (1). Information on the pixel width and the ideal brightness (7) required for the screen size will change at the same time. The audience/image distance shows if pixels can be visible by the little auto-scale window (9) and an alert message (12). You can read your movie file (or picture file) and have a real time render of your focus (supported files : .mov .avi .mpeg .jpg .gif .pict). 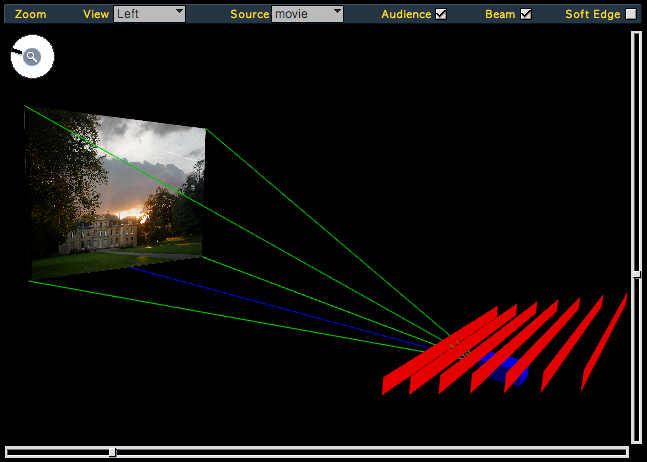 A 3D render window (23) is made to have a 360° view from x, y and z axes. Click on it to move the render. You can also zoom (17) and move the window on x and y axes (24). On top of that, you have a pop-up menu to quickly access different views (18). 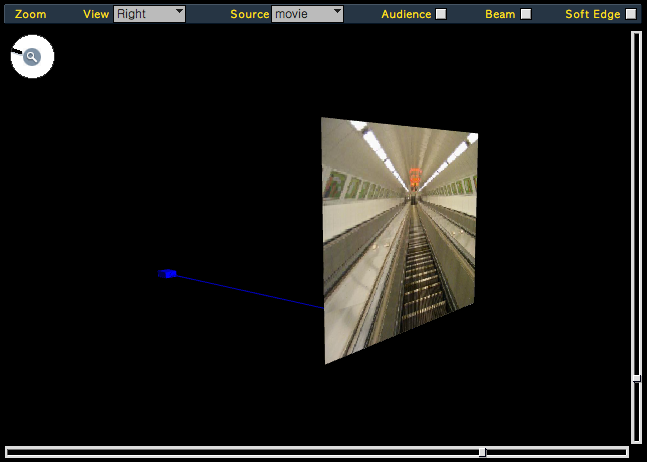 It"s also possible to disable the video screen render on the 3D window with the Source mode. You can do the same with the Audience and the Beam render. • (22) = Enable/disable for Soft Edge calculator. Note : The pixel size is always calculated from the audience view because it's finally the most important thing ! The "Store" (14) fonction records actual values of the selected line, but only for F max, F min and Resolution. The "Edit mode" (16) switches the board to one cell storage, used to insert name, brightness and contrast ratio and also to modify a specific value. 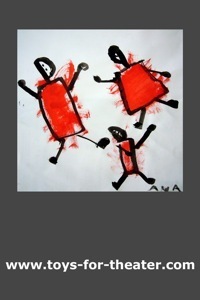 The "Clear" (15) button deletes the current selection, that can be a line or a cell according to the "EDIT MODE".